1. What is an annuity? An annuity is a financial product sold usually by insurance companies to people who wish to make sure that they are going to have enough money to last them for the rest of their lives. For many individuals, this may mean a pension-type annuity called an immediate lifetime annuity. In essence, for a single lump-sum payment, the insurance company guarantees a person a certain monthly income for life. For another investor, a more appropriate type of annuity could be a deferred annuity. In this example, an individual contributes a certain amount each year for a fixed number of years into a tax-deferred annuity. At the end of the fixed term, the individual can take the accumulated funds and move them into another financial product or take the accumulated funds and use the tax-deferred money to make a lump sum payment on an immediate lifetime annuity. 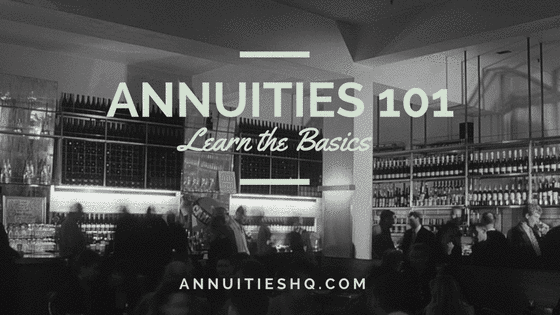 Annuities are easy to define at this level, but there is a great deal to know and to learn. 2. Why would I want an annuity? At some point, you will want to retire or at least reduce your working hours to enjoy yourself. These life changes will obviously have an effect on your level of income from employment. In the past, many of us could count on a company pension but in recent times this is less and less likely. By working with a qualified financial advisor and doing your research here at Annuities HQ, you may discover that there is an excellent, well-suited annuity that will help you with your financial retirement needs. You may simply want a steady, monthly income, or you might have taxation issues that an annuity could help solve. 3. What are the different types of annuities? This is a great question because there is often a lot of confusion when individuals first start considering the purchase of an annuity. There are three basic types of annuities. The first and oldest type of annuity is a fixed annuity sometimes called a “traditional” or “immediate” annuity. In its most basic form, it resembles a classic pension. The second type of annuity is an indexed annuity. An indexed annuity offers the potential to make more than the specified minimum interest rate for the product purchased because it is tied to a stock index such as the S&P 500 Composite Stock Price Index. If the Index goes up, the purchaser can earn more than the minimum rate contracted for, but there is a maximum percentage allowed, however. If the Index goes down, the purchaser still gets the minimum rate of return agreed upon. Lastly, there is the variable annuity. This product is generally reserved for an individual with a higher risk tolerance, as the lump sum or periodic payments are invested in vehicles that are chosen by the purchaser. There is normally no minimum interest rate guarantee as the purchaser is responsible for choosing the options. However, many variable annuity products allow an individual to place a portion of the investment earnings in a fixed minimum interest rate account held within the annuity. Because the investment options for a variable annuity are typically mutual funds that invest in stocks, bonds, and money market instruments, variable annuities are regulated by the SEC (Securities and Exchange Commission). 4. Which annuity is right for me? The answer to that is there is no perfectly simple way for anyone to stand back and say, “This is the annuity for you”. With a little work and the help of a trusted financial advisor, you should be able to find the annuity product that is most suited to your individual situation. It is highly recommended that you do as much research as possible, and you’ve already made an important and wise start by visiting us at Annuities HQ. We recommend you first establish what your financial goals are. You should only consider purchasing an annuity if you have fully funded or intend to fully fund your IRA, 401(k), or 403(b) for the year. These are before tax investments and are the first step in planning your financial freedom. However, if you have already taken care of those investments and still have funds to invest, an annuity can offer significant advantages to complement your investment portfolio. If you know already what you want then your next step is to find a financial advisor to help you determine which of the many options are best for your situation. If you have an idea as to a specific product after having done your research, then you may want to contact the insurance company directly and it may be able to recommend an advisor to you. 5. What are some common misconceptions about annuities? I’ll lose control of my money. All the fees associated with annuities are too much. If I invest in an annuity, I can’t invest in the stock market. A variable annuity is a real risk if the company I purchase it from gets into trouble. We could go on at great length on all of these, but here is an excellent article that will give you some straight talk on these topics. 6. What are the fees associated with purchasing an annuity? This is really a two-part question. The first of which is, “Do I have to pay the financial advisor?” Actually no, the financial advisor is compensated by the insurance company. The second part of that question is, “What fees are associated with the purchase of an annuity?” The answer to that is not as simple. Many annuity products do have certain fees and/or associated costs; however, these can often be lessened or even eliminated with the help of your advisor. For example, you may be considering an annuity that will include your spouse or significant other when you, the original policyholder, die. This may generate a fee, or it could reduce the amount of money you receive on a monthly basis. This may very well suit your plans, or your advisor might recommend that you purchase a life insurance policy to make sure your loved one is taken care of when you die. This could lessen your fees or increase the monthly payments you receive under the annuity. Taxes are complicated, right? Yes, they certainly can be so the information here can only give you a generalized outline. You should definitely talk to a professional if you have questions. Having said that, essentially, any funds you place into an annuity are not taxed (taxes are deferred) until the time the funds are distributed to you. When you begin to draw on the funds, you will pay taxes in one of two ways depending on how the original contributions to your annuity were themselves taxed. If you did not pay taxes on the funds used to purchase the annuity, then the funds you draw out of the annuity are taxed as normal income. The benefit here is that you are presumably going to be earning less per year at the time the payments start, and therefore, you will pay lower tax rates. If you used after-tax dollars to fund your annuity, you are only taxed on the interest that your annuity has earned while in place. If you used a sizeable amount of after-tax income and your annuity performed well, you have accomplished two things: you have saved for your retirement and you have put that money to work at potentially higher rates than was otherwise available. 8. What do the ratings of the various insurance companies mean? Of the four listed, A.M. Best is the only one focused solely on the insurance industry. Each company has a slightly different “grading scale”, for example, A.M. Best might rate a company “A++”, while Standard & Poor’s would rate the same company as “AAA,” but in each case, the ratings mean the same thing (in this example the ratings indicate the best possible credit rating). 9. Can I change my mind after I’ve signed up? This is an important question. First off, you should be certain that you have carefully considered all of your options before you sign anything, but yes – there is usually a “surrender period,” a “free look period,” or, as it’s sometimes called a “cancellation period.” This period normally extends 2 weeks from the date of contract signing but can sometimes be longer. 10. What happens to my annuity when I die? This seemingly simple question is actually a really important one because there are a number of factors to consider. Annuities are contractual agreements that provide annuitants with payments until death. If you die soon after the payments begin, all payments from the annuity cease. However, normally you would have the option of a guaranteed period which reduces your risk of receiving too few payments from the annuity. Selecting a guaranteed period will remove the risk of losing all your money to the insurance company due to an early death. Selecting a guaranteed period might have the effect of reducing the payout you receive because there are generally additional fees involved. Also if you structure your annuity in such a manner as to provide for others when you die this will also have the effect of reducing your monthly payout. Let’s consider a typical scenario: you rolled over your 401k into an immediate lifetime annuity, and you want a “rider” that ensures your spouse will continue to receive income from the annuity after you die (until your spouse dies too). Because the annuity is now based on the life expectancy of both you and your loved one, the insurance company has a higher risk of loss, and it correspondingly reduces your monthly payments to account for the increased risk. If the reduction in income is higher than say a whole life insurance policy on your own life, this may be an instance where you buy a life insurance policy for yourself and take the higher payout from the annuity. Your spouse will be covered and you will be maximizing the amount you can receive from your annuity. Let’s say you do opt to have your spouse continue to receive payments until he or she passes. What happens when your spouse dies? Well, there are a few protections built into annuities, generally requiring additional riders. If you and your spouse die, the actual value of your annuity can be inherited by a named beneficiary. Here is where taxation can be a real issue because your beneficiary has three options. First, the beneficiary can take a lump-sum payout. Second, the beneficiary can take annual payouts that “drain” the annuity within 5 years. Lastly, within 60 days, the beneficiary can elect to annuitize the funds over the beneficiary’s own lifetime. Lump-sum payouts prove difficult when large sums are involved because it can push your beneficiary into a higher tax bracket and he or she would pay more tax than might be expected. Even if you used after-tax dollars, the gains made on your annuity are taxed at normal income tax rates. If half of the value of your annuity is interest gained, even with a 5-year payout, the first funds distributed to the beneficiary are taxed as normal income until the gains are paid out.